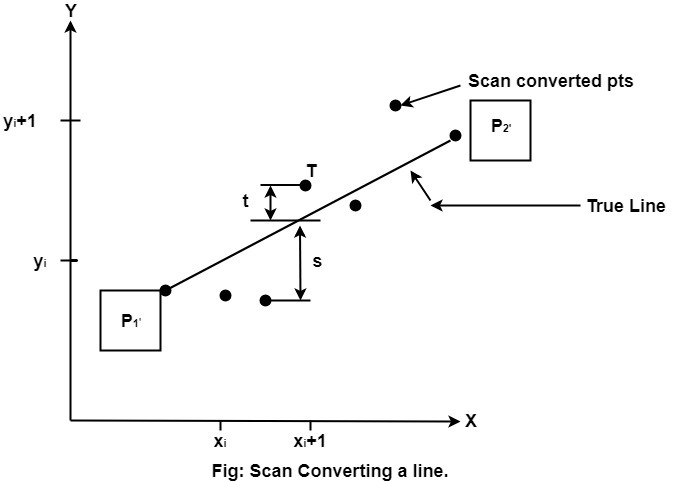 This algorithm is used for scan converting a line. It was developed by Bresenham. It is an efficient method because it involves only integer addition, subtractions, and multiplication operations. These operations can be performed very rapidly so lines can be generated quickly. In this method, next pixel selected is that one who has the least distance from true line. Assume a pixel P1'(x1',y1'),then select subsequent pixels as we work our may to the night, one pixel position at a time in the horizontal direction toward P2'(x2',y2'). The line is best approximated by those pixels that fall the least distance from the path between P1',P2'. To chooses the next one between the bottom pixel S and top pixel T.
1. It involves only integer arithmetic, so it is simple. 2. It avoids the generation of duplicate points. 3. It can be implemented using hardware because it does not use multiplication and division. 4. It is faster as compared to DDA (Digital Differential Analyzer) because it does not involve floating point calculations like DDA Algorithm. 1. This algorithm is meant for basic line drawing only Initializing is not a part of Bresenham's line algorithm. So to draw smooth lines, you should want to look into a different algorithm. 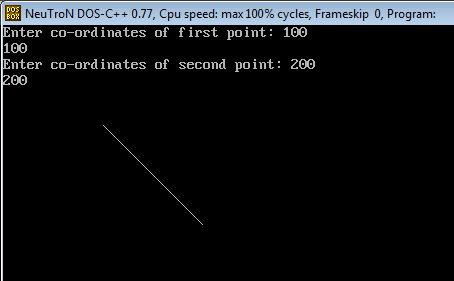 Step5: Consider (x, y) as starting point and xendas maximum possible value of x.
Step6: Generate point at (x,y)coordinates. Step7: Check if whole line is generated. 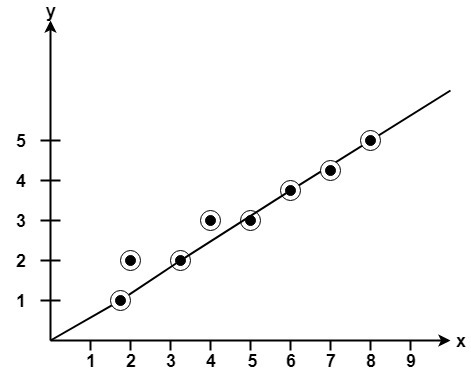 Example: Starting and Ending position of the line are (1, 1) and (8, 5). Find intermediate points. 3. DDA Algorithm is slowly than Bresenham's Line Algorithm in line drawing because it uses real arithmetic (Floating Point operation) 3. Bresenham's Algorithm is faster than DDA Algorithm in line because it involves only addition & subtraction in its calculation and uses only integer arithmetic. 4. DDA Algorithm is not accurate and efficient as Bresenham's Line Algorithm. 4. Bresenham's Line Algorithm is more accurate and efficient at DDA Algorithm. 5.DDA Algorithm can draw circle and curves but are not accurate as Bresenham's Line Algorithm 5. Bresenham's Line Algorithm can draw circle and curves with more accurate than DDA Algorithm.